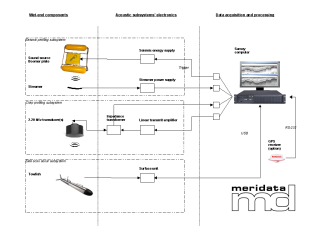 Meridata has long-standing experience of a wide range of geophysical and oceanographic equipment, both as a manufacturer and as a system integrator. This translates into sound choices of survey system components and systems that work flawlessly from the first day of deployment. We are geared to provide a combination of the latest-technology systems for multi-faceted, multi-frequency hydroacoustic geophysical survey. Our systems for mapping sub-seabed geological structures can utilise chirp, boomer, sparker or air gun technologies, or any combination thereof. We offer side scan sonar systems for seafloor imaging. Systems with a broad selection of operating frequencies are available, for use in inland, harbour, coastal as well as offshore waters. Meridata has manufactured and supplied bathymetric systems for more than two decades, and has profound expertise in hardware and software integration of hydrographic survey instruments and sensors. Meridata's turnkey system deliveries always include total system integration, and may also comprise installation, system commissioning and operator training which can be held on site or at our marine training center. We offer support and upgrades during the system's operational lifetime, and will be there to help you select complementary equipment when you need it.